The presidential palaces of Latin America are famous for their imposing Spanish colonial grandeur. Not long ago these marble edifices on grand plazas were inhabited mostly by military strongmen. That these leaders were elites of European descent went virtually without question. Today, Chile’s presidential palace, La Moneda, is the home of a single mother and torture survivor. In Buenos Aires’ famous Casa Rosada lives a man who is perhaps the biggest thorn in the side of the International Monetary Fund. In Bolivia it is an indigenous coca farmer, in Brazil a metalworker and in Uruguay a former leader of left social movements who call these palaces home. In election after election, Latin Americans are choosing leaders who promise a shift from traditional elite-driven politics to more participatory and active democracies that focus on fulfilling the needs of the poor. 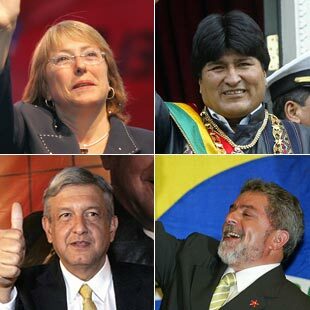 With nearly a dozen national elections coming up this year, including especially significant ones in Mexico and Brazil, this is an important time to assess how far the new leaders of Latin American politics, diverse as they may be, are likely to go in achieving real change. And at a time of virtually one-party rule in the United States, the prospects for real democracy in Latin America offer an intriguing model for the rest of the world. To the extent that U.S. officials have paid any attention to the new Latin American leadership, it has been largely fixated on Venezuelan President Hugo Chávez. In February, Defense Secretary Donald Rumsfeld played the Hitler card, describing Chávez as “a person who was elected legally—just as Adolf Hitler was elected legally—and then consolidated power and now is, of course, working closely with Fidel Castro and Mr. Morales and others.” Other U.S. officials have used Chávez’ fiery attacks on President Bush to raise the specter of a Cuban socialist model being imposed by Chávez and his new allies throughout Latin America. In general, however, Latin America is low on the Bush administration’s radar screen. Although the U.S. government was deeply involved in Latin America during the ’80s, providing military and other assistance to governments fighting internal civil wars, successive administrations have been less concerned with the region since the fighting there stopped. The war in Iraq has pushed Latin America even lower on the priority list. By pulling back from direct political involvement in the region, the U.S. government created an opening for Latin American social movements of small farmers, trade unionists, human rights activists and urban poor to organize and elect new leadership. Their efforts have been bolstered by the failure of the policies that the U.S. government has pushed in the region—fighting drugs and expanding free market reforms. On drugs, the U.S. government’s attempt to crack down on Latin American suppliers was key to the rise of Bolivia’s newly elected president, Evo Morales. A native Aymara and leader of the country’s coca farmers union, Morales is a staunch opponent of U.S. coca crop eradication programs. Although the coca plant is used to produce cocaine, for Bolivians coca in its natural form is as much a part of their culture as coffee is to ours. His courage to stand up to the United States in defending the rights of coca farmers made him a national celebrity even before he went into politics. In February, shortly after taking office, Morales urged the United States to change its drug war policy in Bolivia. He said, “The [U.S.] zero-coca policies haven’t worked. … We don’t want a false drug war.” Then, during Chile’s presidential inauguration in March, Morales gave Secretary of State Condoleezza Rice a traditional Bolivian musical instrument called the charango, decorated with coca leaves—a symbolic reminder that coca farming is legal in Bolivia. While he is committed to pushing for a political program that will benefit the poor and indigenous populations that make up the majority of Bolivians, Morales has shown consistent respect for the democratic process. Morales is the first indigenous president in Bolivia’s 180-year independent history. With 54 percent of the popular vote, he’s also the first president ever to win an election with a clear majority in the first voting round, starting his term with a strong mandate and high expectations. Morales also got a huge boost from U.S. support for the policies of the World Bank and International Monetary Fund (IMF). 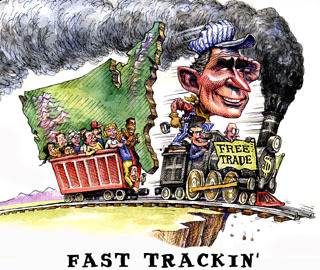 Following on the heels of the Reagan-era’s “trickle-down” economics, which posited that benefits for the rich will “trickle down” to the rest, Washington has used its power of the purse and its leading position within international lending institutions to guide Latin American governments toward economic policies that restrict public spending, increase the role for the private sector, and dismantle the system of import taxes and other tariffs in order to facilitate international trade. Lending agreements from the IMF and the World Bank during the ’80s and ’90s came riddled with conditions for countries to manage fiscal deficits by lowering government spending on social programs, including health and education. “Cutting public expenditures by any large degree cannot be done without affecting the poor who rely on public services, or provoking huge rebellions,” says Jim Shultz, director of the Democracy Center in Cochabamba, Bolivia. Yet in 2003, the IMF demanded Bolivia cut more than $250 million, or 8 percent, of the national budget. In Deadly Consequences: How the IMF Provoked Bolivia into Bloody Crisis, Shultz details how the Bolivian government tried to warn the IMF that this would incite popular unrest. Bolivians deposed two presidents in as many years through protests against these types of policies and then elected Morales. Argentine President Néstor Kirchner also owes much of his success and popularity to his resistance to the IMF. Since assuming office in 2003, Kirchner has been a tough negotiator with the IMF. He has resisted demands to slash spending, lift controls on public utility prices and implement banking and tax reforms, and instead he has pushed for investment in the public sector and protection of Argentina’s poor. Argentina, once the poster child of the IMF, has made a remarkable comeback since its economy collapsed in 2001 after a decade of closely following IMF and World Bank prescriptions. While in 2000 growth was a negative 0.8 percent, growth from 2003 to 2005 under Kirchner’s watch exceeded 8 percent, with low inflation and falling unemployment and poverty. Consequently, Kirchner now commands a stunning 80 percent approval rating in opinion polls. Brazil, too, has reaped considerable benefits from its government’s determination to balance external pressures to adopt a cautious macroeconomic strategy with internal demands for higher standards of living for all Brazilians. Economic growth in 2004 was the highest since 1986, with gross domestic product (GDP) increasing 5.2 percent. The U.S. government’s aggressive push to expand free trade in Latin America also helped catapult other new leaders into the presidential palaces. Luiz Inácio “Lula” da Silva in Brazil made his opposition to a proposed hemispheric trade deal, the Free Trade Area of the Americas (FTAA) a centerpiece of his 2002 election campaign, calling it an “annexation agreement” rather than an integration agreement. He then helped lead resistance to the FTAA among other wary developing countries, resulting in a deadlock for the past several years. Likewise, in Costa Rica, opposition candidate Ottón Solís nearly pulled off a stunning upset in that country’s February election, thanks to his popular position against the Central American Free Trade Agreement (CAFTA). CAFTA passed the U.S. House of Representatives last summer by only two votes. Lula and Solís were riding a wave of widespread outrage against the failure of trade and investment liberalization policies (often called the “Washington Consensus”) imposed on the region since the ’80s. No region of the world had gone further to adopt these reforms, and yet, while promoters argued this would lead to prosperity, Latin America has experienced rising poverty and inequality. The World Bank estimates that the number of Latin Americans living on less then $2 per day increased from 99 million in 1981 to 128 million in 2001. According to the United Nations, the gap between rich and poor has continued to grow and Latin America has the most unequal wealth distribution of any region in the world. The democratic opening that occurred after the infamous era of military dictatorships allowed social movements to express their discontent. The traditional conservative elites who were aligned with the United Sates were voted out, and replaced by socially minded, left-leaning leaders. It is somewhat simplistic to characterize the changes taking place in Latin America as purely right versus left, but it is undeniable that there is a general shift toward the left. However, in Latin America the political spectrum is relatively wide and what are considered left governments vary greatly from country to country. Their common thread is that they all support state involvement in pursuing economic and social policies focused on improving the lives of the poor. Both Venezuela’s Chávez and Uruguay’s Tabaré Vázquez are self-proclaimed socialists, but Chávez is a far more aggressive opponent of U.S. trade and investment policies, once calling the proposed FTAA “the cauldron of hell itself.” He has also plowed massive amounts of government money into health and education programs, part of what he calls “socialism for the 21st century.” On the other hand, Vásquez has thus far kept fairly intact the Washington-friendly economic policies he inherited, and recently signed a bilateral investment deal with the Bush administration. Unlike oil-rich Venezuela, Uruguay is constrained by a massive debt burden, equivalent to roughly 90 percent of its gross domestic product. Likewise, Bolivia is the second poorest country in South America, and part of the World Bank’s highly indebted poor countries (HIPC) initiative to reduce external debt. Morales will likely face similar restraints in his choices for revenue allocation—whether to increase teachers’ salaries or make debt payments is not an uncommon choice for Latin American presidents. Nearly a dozen national elections are slated to take place this year in Latin America, and candidates of the left are leading contenders in many of them. Two elections in particular have important implications for the United States: Mexico and Brazil. Together, they are home to 60 percent of Latin America’s population and represent more than two-thirds of economic power in the region. Mexico shares a 2,000-mile border with the United States and is the country’s largest trading partner in Latin America. This year’s presidential election, scheduled for July, is only the second since 2000, when the Institutional Revolutionary Party (PRI) was voted out after 71 years of undefeated rule. The candidate of the left, Mexico City Mayor Andrés Manuel López Obrador, has been the front-runner since the start of the official campaign season in January of this year and continues to lead in the polls. López Obrador has pledged to block attempts to open the oil and gas industry—which is state-owned—to private investment. This is a controversial issue for President Bush, whose pledge to shift the U.S. oil reliance away from the Middle East depends on Latin American exporters like Mexico remaining loyal to their number one client. Ensuring that American oil companies have access to Mexico’s huge reserves would make that job much easier. It is also the first time in Mexican electoral history that citizens living outside the country will be able to vote from abroad. This adds a potential four million outside voters just this year, 85 percent of whom are living in the United States and have tremendous influence back home. Last year, Mexicans sent over $20 billion to their friends and families in Mexico. “Depending on how you measure it, remittances are the second or third revenue stream for Mexico, after oil exports and tourism,” says Brooks. “Mexicans in the United States care about what happens at home.” This point has not been lost on Mexican political hopefuls, who have routinely campaigned in Chicago and other U.S. cities even before the large communities of Mexican immigrants there were allowed to vote. When current Mexican President Vicente Fox came into office in 2001, he managed to get Bush to promise to overhaul the current immigration legislation, and to strike a deal with Mexico on special work programs and possible amnesty for undocumented immigrants. The Bush administration has failed to do either, which will likely have a high political cost for Fox’s party, the National Action Party (PAN), to the benefit of López Obrador. In Brazil, Lula is seeking another term. Although he has been critically weakened by a series of corruption scandals in his Workers’ Party (PT), the latest opinion polls show him in the lead. This year, the PT’s main contender is the more conservative Social Democratic Party of Brazil (PSDB), which governed from 1994 to 2002. Although Lula has not been personally implicated in the scandals, many feel he should have done more to fight corruption. There is also considerable disappointment that he has not gone further to follow the example of his neighbor in Argentina to challenge the IMF. Nevertheless, the former union leader’s victory in 2002 is still widely viewed as a decisive step in the direction of stronger democratic rule in Brazil. Latin America’s rejection of Washington’s favored model of economic management has caused strained relations with the White House. Public opinion polls in the region consistently show people’s preference for a break with Washington. Many Latin Americans think that the United States is largely to blame for their countries’ increasing poverty and inequality. Anti-American sentiment has also risen since the U.S. invasion of Iraq and the scandals of prisoner abuse at Abu Ghraib and Guantánamo. Public sentiment holds that the United States is not following international norms and is not playing by the rules, as other countries are expected to. According to the Pew Global Attitudes Project, a series of world-wide public opinion surveys, “rising anti-Americanism is not confined to Western Europe and predominantly Muslim countries.” A recent Pew survey shows that while 52 percent of Brazilians expressed a favorable opinion of the United States in 2002, by 2003 that number had dropped to 34 percent. In the minds of many, the Iraq war has only confirmed the worst stereotypes about U.S. militarism, unilateralism and imperialism. A sense of mistrust toward American corporations doing business in Latin America is also prevalent. The Bush administration should be paying close attention to what is happening in Latin America, without repeating the mistakes of the past. It should define a clear policy for the region that is based on supporting democratic processes and institutions, and should seek to ensure that democratic governments like that of Evo Morales in Bolivia succeed. The United States should be more tolerant of those leaders who do not necessarily toe Washington’s line, and show that it is committed to democracy, regardless of what candidate the people choose. After all, economically successful neighbors make reliable trading partners, and politically stable governments make good global allies. Still, it remains to be seen if the New Left in Latin American will be able to overcome the endemic problem of poverty by fashioning bold solutions in Bolivia and beyond. Efforts such as Argentina’s attempts to work more closely with Brazil, Venezuela and others are hopeful signs. Last year, Kirchner paid off the last of its debt to the IMF, with the help of Venezuela. Other countries, such as Ecuador and Bolivia are also trying to break free from the shackles of the IMF, with help from their neighbors. It’s just a start, but this may give governments a little breathing room to deal with urgent issues of poverty and misery in their countries. Roque of ActionAid explains that if the United States doesn’t allow the space for governments to experiment with alternatives, such as increasing social protections or promoting national industry, it will be preparing the ground for all kinds of dangerous repercussions. Any attempt by Washington to tie the hands of these new leaders when they make economic decisions they believe are in the best interests of their people will only increase public frustration, and that can lead to extreme populism, from the right or the left. Although not a bad thing per se, populism can be used to promote radical ideologies that claim to represent the majority of the population. Nadia Martinez was born and raised in Panama. She is co-director of the Sustainable Energy and Economy Network, a project of the Institute for Policy Studies in Washington.